The 10:15am Sunday service at St. Paul’s Anglican Church, North Caulfield, is billed as a “Communion Service,” and is one of two liturgies there each Sunday, the other being in the early evening when then alternating eucharistic worship with some sort of service of the word. The 10:15 event drew its shape and some of its resources, especially texts, from A Prayer Book for Australia [APBA], and yet it also included a number of other elements which mark it out as a “charismatic” church (that is, having Pentecostal church-style blended into old-line denominational patterns), such as on the occasion of my visit the “testing” of a “word of knowledge” and a strong emphasis on the church’s healing ministry. The diocese of which this church is a part is notoriously polarised, with on the one hand a significant presence of GAFCON-aligned or leaning conservative evangelicals (a constituency that appears to be growing), and on the other, a depleting “catholic” contingent that can be marked by a strong conservatism of its own—if not always like the GAFCON types theologically conservative, then sometimes liturgically calcified, and (except in ethnic minority majority catholic churches) having a disturbing lack of young people in its ranks. While older adults were in a slight majority at St. Paul’s, its widely representative intergenerational make-up would be just one marker that would locate this congregation towards the evangelical end of this spectrum. However, it would also stand in stark distinction from a more restrained, much drier, kind of worship associated with Sydney Diocese, the main driver of GAFCON in Australia. Circa 150 persons gathered for morning worship at St. Paul’s, though notices and a pew-sheet informed that the evening service (which I later learned typically gathers between 40 and 50 persons) was “aimed at young adults,” and largely led by young adults (though its—according to the pew-sheet—“fresh and welcoming atmosphere” is “for all”) and this means that only a small handful of the younger adults present in the evening also attend the morning service (about which I was informed by one young man who identified himself as a dual attender). Another factor that may have impacted the attendance figures on the morning of my visit was that the women’s Bible study group was away on retreat that weekend. In any case, five minutes before the advertised service time, there were as many people in the large band and singing group as in the main blocks of pews, though reading the pew-sheet informed that persons may have been for breakfast “coffee, toast and newspapers” in the narthex space before worship. At 10:15 people steadily began arriving in numbers, with others straggling in for about the next half hour, throughout the gathering rites. This informal way of gathering is notable not least for its congruence with some informal markers on the exterior of the building as one approaches. Firstly, a large sign high above the (very busy, intersecting multi-lane) street proclaims, simply, “OMG.” On a large glass window at street level, a makeshift storey-high impression of the face of Jesus had been made on the glass with paper or paint, the image itself akin to the Che Guevara-like face used some years ago in the Church of England’s official Christmas publicity, but here juxtaposed to the words, beneath Jesus’ face, “it’s all about me.” As people gathered in the sanctuary, an informal tone shaped the atmosphere, a most important aspect of which included the noise being made by children, which continued throughout. Whilst children were to be seen all around the room, a particular place for their play had been made in the baptistery area at the back, in which the font was found (had been moved?) to one side of a rear alcove, with tables, toys, books, and crafts provided for their enjoyment. At one point in the informal gathering rite, children were also focal, coming together to the front to lead the assembly in a song. Aside from the baptistery area made especially hospitable for children, other pews all faced forwards towards a clearly key area in a front alcove in which the altar-table was central, with band members and singers on either side, but at such a distance as to not obscure the table. And just as space to left and right of the table was clear, so was the space above it, where a screen hung from the ceiling, but again at some distance. The proportions of the high arch and width of the building allowed the altar-table ample room. It also stood in pools of light in what was an otherwise rather dark space, even on this bright morning, making clear that the table was the focus in this communion service. (Interestingly, by comparison, the ambo/lectern was first of all clear perspex, and secondly used only by the band leader, and gospel reader, but not preacher, and thirdly, moved about to suit.) As people gathered, the screen above the table gave various pieces of information about upcoming events and ministries of the church: a mindfulness and meditation group, and a group for learning English as a second language, for example. After the opening greeting and gathering song, time was made for people to read the various notices from the screen as some tinned music played, rather than having all of the notices verbalised. Furthermore, this was not the only time such tinned music was used (other times included a children’s song as the children gathered together at the front to sing, and “Gabriel’s Oboe” from the movie The Mission, as people prepared to form a communion procession), but to me this non-live music seemed a little odd given the number of people present with gifts to make music themselves, and the high quality of the musicianship in the band. 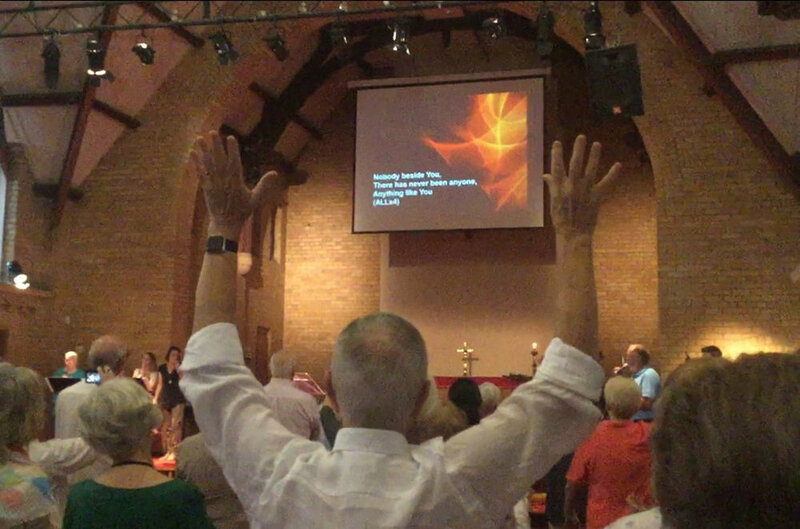 The gathering rites included one slice of liturgical text, taken from A Prayer Book for Australia: the general confession and absolution, words for which were projected onto the screen. Other liturgical texts, for example, “The Lord be with you,” were absent from the style of gathering, and in fact a repeated greeting, spoken by several persons who stepped up to a microphone for various reasons during the opening minutes of the service, was “Morning church.” Otherwise, prayers in this opening section were extempore, mainly by the lay woman leading the band, but also including an extempore pastoral prayer in thanksgiving for the life of a church member who had died earlier that morning, led by one of the ordained ministers. Neither he, nor his ordained male colleague, wore either liturgical or clerical vesture, but informal street clothes, although later in the service the presiding minister donned a purple stole which he picked up from the table, where until the song before communion it lay alongside an old-fashioned burse and veil for covering the eucharistic vessels. These pieces of purple haberdashery would have been one of the clues (to a certain kind of participant—though perhaps few present?) that the service took place in the season of Lent. The band that were prominent at different points in the service were highly able, working across some different styles and a range of tempos, with notes of jazz and skiffle, as they accompanied the congregational song, for which again words were projected onto the screen. All of the songs were recent compositions, and no use was made of historic hymnody. Notably, though, whilst the songs were all “praise and worship” choruses, they featured stronger narrative dimensions than is sometimes the case in this genre, and all consistently worded the mighty acts of God in Christ Jesus much more than expression of personal feeling. That being said, there was some strongly expressive participation, with almost from the first note of the opening song swaying, clapping, hand-raising and dancing among the congregational members. This happened in all of the songs, and hand-raising was most notable also during a spoken part of the service, with several people around the room standing with their hands held high for the eucharistic prayer, with a majority doing so for the Sanctus (“holy, holy, holy…”). Curiously, whilst one of the songs stressed imagery of “bowing down” before the crucified and risen Jesus, whilst there was lots of orant prayer, no-one bowed; whilst gestures were widely employed, they were limited in range. All but one (one of the ordained ministers) who took focal and vocal leads in the service were from visible ethnic majorities—that is they were “white”— though a significant minority of congregational members were from a variety of heritages that are minorities in Australian context: Arab, Indian, East Asian, and so on. In terms of gender, leadership was mixed, though a male (ordained) person both preached and presided in communion on this occasion. And apart from children leading a song, and other younger members being part of the band, a young woman read the gospel portion of the day, which was John 13:1-15. The prayers of the people followed the sermon and voiced concern for the wider world that echoed themes in the sermon itself. If the sermon had spoken of welcoming strangers and feeding the needy, now prayer named persecuted, refugee, and imprisoned persons as foci, alongside politicians with responsibilities for shaping the common good. The earth itself, and particularly the current “energy crisis,” was also lifted before God. These prayers were led by just one voice, by a man rising from his place in the congregation. They led to the greeting of peace and offertory prayer, both in the default form from APBA, and for which words were projected onto the screen. An hour into the service, these were only the second instance of use of authorised liturgical texts from denominational resources. As the presiding minister prepared the table for communion, he donned the purple stole which had lain on the table and wore it through the communion rite, laying it down again as communion was over. (Interestingly, no comment was made on this symbol, its use for only this part of the service, or its historic associations with the towel Jesus wore to wash others’ feet, transposed in Christian liturgical tradition into a symbol for leaders of Christian assembly.) The words of eucharistic prayer (again from APBA) were again projected onto the screen above the focal table, with (as already noted) many congregants joining the presider by praying orant, hands raised, for the Sanctus if not the whole prayer over the gifts of the table. Using a large bread wrap, the presider used manual acts during the institution narrative (recalling the words of Jesus at the so-called Last Supper), which to me seemed an overly and unnecessarily clerical gesture in an assembly that had otherwise emphasised wide participation and the ministry of many. Most unusual, though, was that during the eucharistic prayer, the presider stood alone at the table, singly in the “sanctuary.” Other eucharistic ministers (as it happened all women, five in number) joined the presider only for the actual action of distribution of the sacramental gifts. So the visual theology of the service during prayer at table seemed to work against some of its articulated vision of mutual service and in other ways vibrant culture of participation together. Other aspects of the communion rite did, however, move in a more communal direction, not least the Prayer That Jesus Taught which was prayed aloud in a variety of languages and presented on screen in Arabic, Mandarin and Spanish as well as English. The closing was simple, but included the announcement of a “word of knowledge,” another element of Pentecostal/charismatic worship, presented as a conviction voiced by a congregation member that God was saying something specific to someone today, a very personal word for one, or some. This focused on divine desire to heal “lower back and joint pains.” After this “word,” the leader encouraged anyone hearing it as being “for them” to present themselves for prayer ministry with the laying on of hands—a regular practice at this church, involving people gathering for informal, tactile, personal, prayer after communion. Otherwise, the closing involved words of blessing and a dismissal (again both from APBA, but this time with the blessing from APBA’s Lenten provisions) and two more songs, one of which was repeated, and which evoked much embodied participation—orant prayer and dance especially. As the quieter song during the preparation of the table had emphasised the cross of Jesus, now the commissioning song celebrated the resurrection, and these two juxtaposed gave the rites around the table a strong paschal mood that strongly converged with the texts of the prayer book’s liturgy of the sacrament. Near to the beginning of the service, the band leader had prayed that the assembly would be “marinated in the word, filled with the Spirit,” and during these songs at the close, she now encouraged “spending some time in our hearts.” The movement was not so much towards sending (rather, a stress on service after the service had very much been the message of the sermon) as to a deepening sense of closeness to Christ who had made himself present in the word and in the gifts of the table. As songs throughout had variously said, “Jesus at the centre of it all,” “everything revolves around you,” with voices echoing the words in the window as one approaches the building and steps towards the door. The hour and a half long service had been marked by a wide and lively sense of intimacy, and evidently people were open to more. While some decamped to the narthex for more coffee and cakes, others stayed for prayer, for ministry, and maybe for a sense of divine gentle touch on aching back and joints. Liturgical vesture: cassock, alb, etc; clerical vesture: dog-collar, etc. The formal term, meaning “prayer,” for the posture of standing arms aloft, hands high.